Garba is such a folk dance which has its popularity soared beyond the geographical boundaries of the state (Gujarat) and the country (India). Today, various garba dance forms are celebrated at far-off places like the US and UK, as a large populace of Guajarati resides there. Originated in and around the Gujarat region, the dance shows quite a lot of similarity to the classical Indian dances like Bharatanatyam and Odissi. In garba dance, elaborately dressed women venture out to the open spaces, form a group, sing together and enjoy the occasion of Navratri. Clapping, gyrating the body and going around in a circle, the women form a circle, keep an idol of the goddess in the centre and steadily dance to the tunes of popular songs. The music is synchronized and amid constant claps, the energy level of participants rises to a crescendo. To match the charm of the most colourful dance form in India, garba dresses of both men and women would be colourful, attractive as well as traditional. Most of the women choose to wear a sari, while young girls prefer superbly embroidered petticoats and ghaghara with head cover odhani. On the other hand, the men prefer kediyum shirt, vajani trouser and a headpiece to suit the multi-coloured ambience. 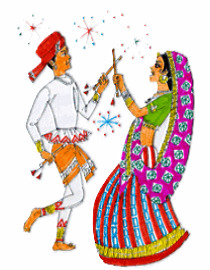 Initially, men used to perform “raas” which was also a traditional form of dance; later on, sticks were introduced to the same dance and thus, it became dandiya. In today’s time, dandiya is a version of garba dance wherein colourful sticks are clanged together by the people in the circle. With the rising popularity of dandiya, the once quiet yet charming garba has now grown into a more lively and delightful dance form.